The 7 Generation Games offices have been busy again this week as development and testing continues on our our newest game, AzTech. As schools test the playable version, we are fine tuning levels and double & triple checking math challenges and activities. In wanting to share elements of AzTech with the 7 Generation Games community, we have created an AzTech Teacher Resource page on our website. We have compiled various learning materials pulled directly from the game, providing FREE content for teachers and parents to use. The page offers tools such as activities, clip art, PowerPoint presentations and videos. For today’s Freebie Friday, we’re sharing with you two videos giving us a look at Mayan culture, specifically how they lived, traded and hunted. Using bar graphs, Mayan Trading explains what the Mayans valued for trading and the worth of items such as gold, cacao beans and obsidian. Additionally, Mayan Hunting uses bar graphs as well, to teach us the type of animals the Mayans hunted and how many people each type of animal fed. 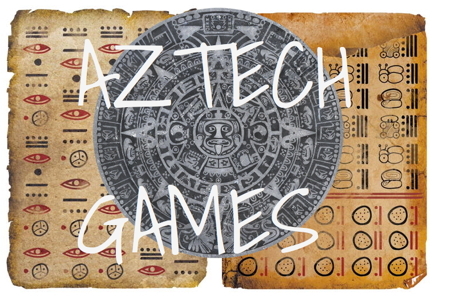 The game of AzTech begins when two students are kidnapped and taken back in time to the Mayan empire. They need to find their way back to Iowa in 2015, learning about their history and statistics along the way. AzTech will be our first bilingual game, as well as our first game for the iPad. Don’t forget about our 7 Generation Games YouTube channel which has many informative videos, covering everything from history, culture and math.